To start, I often consider myself a middle school Humanities teacher turned 5th grade everything teacher. 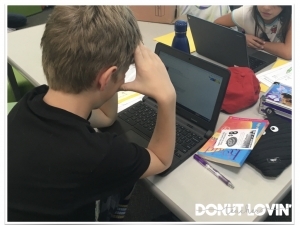 Having spent five years teaching subjects such as english, social studies, art, ELD, and journalism to some of my favorite human beings in grades 6-8, thinking like a mathematician or scientist didn’t seem to come as naturally in making the transition to elementary education. It’s safe to say that I am not always as confident in my math and science instruction. After learning about NOVEL ENGINEERING, which is described as, “an integrated approach to teaching engineering and literacy,” I was interested–but reluctant to try it. 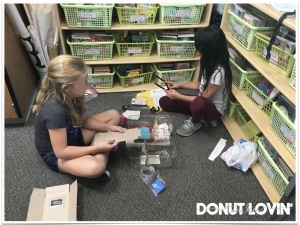 To briefly elaborate on the concept, students read a book, identify a problem a character faces, and work to design and create a working prototype that will help solve the problem! After looking at the novel engineering website, my team teacher and I decided that Hatchet by Gary Paulsen would tie in well with life science standards in fifth grade and engage our students with some great opportunities to design! 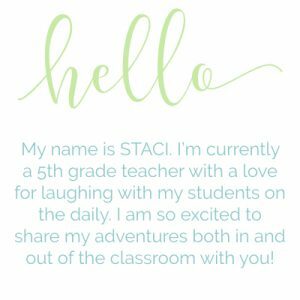 My excitement was rooted in the fact that it would encourage my students’ curiosity, creativity, and problem-solving skills. I also found comfort in knowing that I could rely on a novel to help support me through a new science approach. HERE is the Project Handout sheet we made for our students and families to gain insight on what we would be working on in the coming weeks. 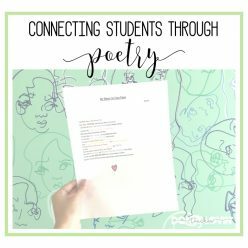 My biggest worries were rooted in a lack of supplies and a fear of the unknown–not knowing what the students would create! What if they wanted to make something that I didn’t know a lot about? How could I buy supplies for them when I don’t even know what they want to build until the last minute? Nonetheless, I got some basic supplies and made sure to make them accessible to my students in a mini “Makerspace” area of the classroom. 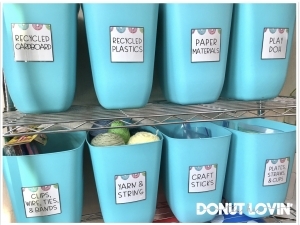 The containers are actually these trash cans and you can get these printable labels HERE. Another great use for the Adhesive Pocket labels from Target! We launched our project by giving our students a taste of novel engineering first using the book Muncha! Muncha! Muncha! We were able to go through a shortened version of problem and solution process in just one sitting. Furthermore, to excite students about the novel, my partner teacher prepared a “Character Bag” full of items related to Brian. I selected students to come pull one item out of the bag at a time and we made predictions about how it might be related to the story! As we read the novel, we also spent time talking about problems Brian, the main character, faced. 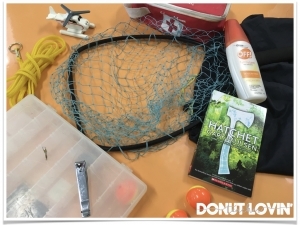 One of my students’ favorite activities was spending time on these Hatchet STEM Challenges by the Smart Chick. With a couple of parent volunteers and my student teacher, the kids rotated through four different challenges in small groups. It was amazing to see the way they worked together and thought outside of the box! Students were able to utilize knowledge gained from these experiences during their actual build time. In addition to this, we partnered with a local college’s civil engineering program to create buildings that could withstand a shake table! College students came in to talk with my students about different structures, constraints, and building materials. From there, my students were tasked with the challenge of creating a multi-story building out of popsicle sticks, straws, and rubber bands. Throughout the process, we focused heavily on creating multiple drawings and drafts that were improved upon each time based on observations and feedback. 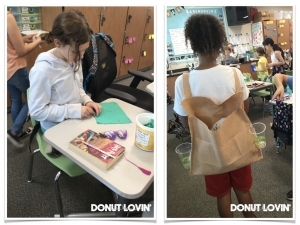 To continue engaging our students in the ideas of the design process, we made sure to see how others in our community might use a similar process of design. 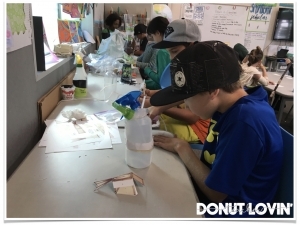 We visited a local “Makerspace” lab that allowed students to see the way others turn an idea into a creation using a range of tools such as laser cutters, digital embroidery machines, and 3-D printers. As fun as it was for students to see the process that others go through, I wish that there was a stronger connection between our visit here to our actual project. As described in the project handout, we covered reading and writing standards throughout this project. We analyzed conflict, characterization, and plot while reading the novel and kept track of key events by creating Matchbook Chapter Summaries. You can read the PERSUASIVE TASK AND SAMPLE STUDENT WORK HERE and the INFORMATIONAL TASK AND SAMPLE STUDENT WORK HERE. I loved the way these writing pieces allowed us to incorporate writing hooks, summaries, using evidence based responses, and a focus on informational text features! One really memorable part of this project was giving feedback to one another, which also incorporates some listening and speaking skills. I had all of my students push the tables together and squeeze around it so they all could fit in a circle. I sat outside of the circle and chose one student to be the facilitator and another to be the time keeper. 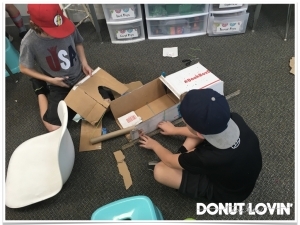 The students took turns looking at prototypes as a class and coming up with ways that it could be improved upon while I typed notes for the students that I printed during recess and handed to them during the afternoon build time. Since then, my students actually requested we sit like this more often. I also think they loved having the opportunity to share their voice and have their work validated. 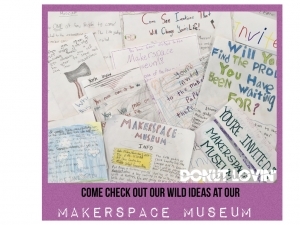 To ensure an audience would check out our cool products, we made sure to write invitations! 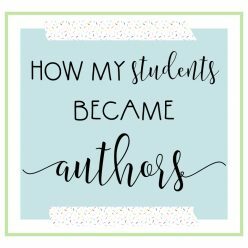 I introduced the ideas of ethos, pathos, and logos to convince people that it would be beneficial for them to learn about the new ideas my students wanted to share! We also practiced presenting our work with the other fifth grade class and some seventh grade classes! The teachers then had a discussion with their classes and came up with a list of warm and cool feedback for my students to review that would help improve upon their presentation skills for their big day! A couple of students in my class asked if they could make flash cards to help them remember what they wanted to say, and soon after all of my students were doing the same thing! 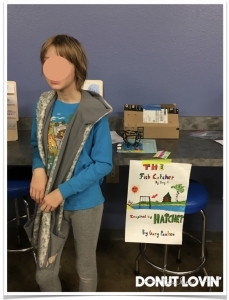 On the day of their “Maker Space Museum” exhibition, my students displayed their prototypes, Matchbook Chapter Summaries, and their writing pieces. 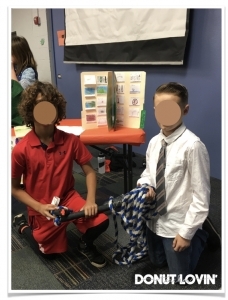 We gave parents and visitors specific questions to ask students such as “What would you do differently if you were to build another prototype?” and “What was most challenging about this project?” The students came dressed up and ready to share! We invited younger grade levels and family members to come check out our inventions and it was so fun to watch my students share their products and take so much ownership for their ideas! 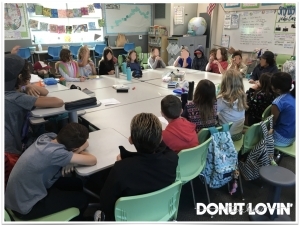 STUDENT VOICE AND CHOICE: From choosing whether or not to work in a partnership to choosing what problem and how to solve it, all of my students gained valuable insight on what it means to innovate, market, and inform for specific audiences. 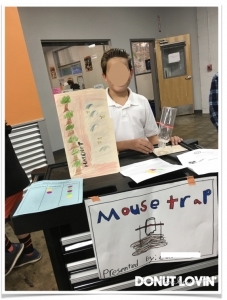 CREATIVITY AND INQUIRY: What I loved most about the entire project was that there was not a set of directions the students had to follow, but instead they had to be creative on their own which gave them a chance to experience genuine inquiry. 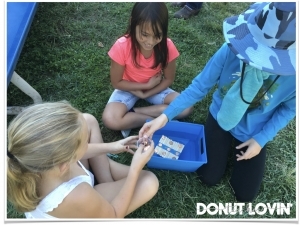 The greatest benefit of this project was that there were lots of “What if I try this…?” or “How can I improve…?” moments that required them to use their decision-making skills!